Spring weather in family-friendly San Diego may not be as warm as the Caribbean or coastal Mexico, but it’s gorgeous and filled with places to go and things to see! Perfect for Spring Break fun! Sunny days, average highs of 66 degrees and average lows of 53 degrees with little humidity- could not be better for visiting theme parks, amusement parks, the zoo; biking, hiking, kayaking; ballooning, boating; land tours, water tours; and beaching. Going to the one of the many beautiful beaches along a 70-mile stretch along the dramatic Pacific coastline is a must. Just don’t expect to go swimming- the water is cold. Spring water temperature is about 60 degrees! Pacific Beach, just north of San Diego is the place to go to experience a classic California beach town. Walking or skateboarding down the 3-mile boardwalk, popping into funky shops, grabbing a bite to eat at a taco shack or nice restaurants; watching surfers and people. It has it all. Be forewarned: it will be packed. It’s a favorite hang-out for college students day and night. Although about 2 hours from San Diego, it tops every list. The first of Disney’s delightful immersion into the world of make-believe, it’s a place without cares. Fantasyland, centered by the magic Castle. It is filled with rides and adventures of Disney favorites: Peter Pan, Dumbo and Pinocchio. Frontierland is about the best with animals on Big Thunder Ranch and Mark Twain Riverboat rides. It’s off into the mysteries of space and ocean depths in Tomorrowland. Little ones are sure to make friends with their favorite characters in Toontown. Older kids flock to Adventureland for the excitement of Indiana Jones and jungle surprises. Strolling, shopping, having a bite to eat in a themed restaurant in Main Street USA are part of the experience. There is more Disney magic next door. Smaller than Disneyland, it’s a Walt Disney’s California-meets-Disney’s-Pixar experience with attractions, rides, character experiences, shows and events. Pixar-related fun focuses on Toy Story, A Bug’s Life, The Good Dinosaur, Finding Nemo and Frozen- favorites of younger kids. Older ones gravitate towards great thrill rides with names like California Screaming and Twilight Zone. On the flip side, there’s a nostalgic journey to a California Coastal Boardwalks with all the old favorites: carousels, Ferris wheels, and games. And of course, there’s plenty of themed food and shopping throughout. This amusement park is built on those plastic bricks and is a multi-generational favorite! It has everything kids have imagined and created with LEGOS, but only bigger! The fun begins at the entrance where bright red Bronte looms overhead. With over 60 LEGO-related rides, attractions and shows, Legoland delights. Here’s the general idea: The Coastersaurus Ride keeps the dinosaur theme going with lots of LEGO dinosaur appearances. Safari Treck is a fun jeep drive through an open African plain filled with LEGO wild beasts! Flight Squadron is a fun ride for younger kids who can’t go on the 6+ safari. Skipper School is a way to get out on the water without getting wet. Miniland USA, a collection of created-to-scale American cities built with LEGO’s – 20 million of them – is fascinating. StarTrek, of course is wildly popular. All ages enjoy the thrills of Knights’ Tournament and Dragon Coaster. Having little to do with LEGOs, XboxWB Family Game Space keeps older kids engaged. This is a day spent exploring the mysteries of the ocean and connecting with sea creatures through a nice balance of multi-sensory experiences. There are shows with live animals to watch, exhibits with live animals to see and touch, and thrill rides – both actual and virtual. It’s entertaining, educational and hands-on. Check out the shows, which include One Ocean’s Killer Whales, Sea Lions LIVE, Blue Horizons with fast-swimming dolphin, and animal training in Pets Rule! are popular. Walk through a clear tunnel with sharks swimming overhead or become immersed through technology in the hazardous journeys undertaken by sea turtles. Watch penguin antics in Penguin Encounter or reach in and gently touch small creatures of the sea in Explorers Reef. It would not be a California theme park without thrilling coaster rides, and there are plenty of those – ocean-themed, of course – plus chances to get soaked on rides through rapids and down waterfalls! Located inland between Carlsbad and San Diego, animals from all over the globe – gorillas, rhinos, giraffes, lions, tigers, cheetahs, elephants, antelopes, camels, monkeys, exotic birds and so much more. Roam in a spacious 1800 acre natural setting. The park’s mission is one of wildlife conservation and breeding, but to the visitor, it’s a place to see animals up close, go on a choice of interesting safaris (even one by hot air balloon! ), see animals behind the scenes, enjoy theme park attractions, zip lines, a carousel, play areas, a petting zoo, shops and themed dining choices. Is in the Mission Bay area of San Diego and is an oceanfront amusement park from another era. It was developed in 1925 and is still hugely popular. Compared with high-tech theme parks, it’s a simpler place with some of the early rides still in place. Giant Dipper, a fan favorite, is an old-time wood roller coaster. It’s been around so long that it’s on the National Register of Historic Places! There’s something here for everyone – a carousel, bumper cars, arcade and midway games, plus thrill rides, water fun, zip lining, rock wall climbing and a laser maze, not to mention wonderful ocean views! There’s no need to leave San Diego to visit a zoo. Animals of every kind are exhibited in as natural habitats as possible throughout 100 acres of lovely mature grounds in Balboa Park. Wear comfortable shoes, be prepared to walk a lot (it’s hilly). With so many animals to see spread out over a large area, the best approach to figure out which animals are where – gorillas, tigers, pandas (visitor faves), koalas, polar bears, leopards, elephants, giant tortoises and more – is to start your visit off with a double-decker Talking Bus Tour. It provides a great narrated overview along with the lay of the land and location of habitats, all helpful in deciding what to spend time seeing. 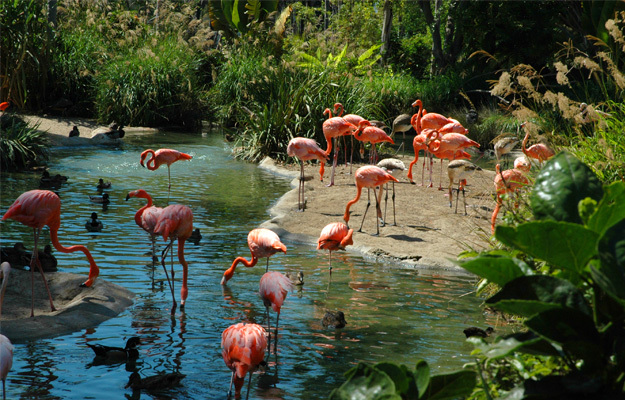 Children’s Zoo is perfect for little ones to see animals up close. Special programs for additional fees are great for interactive experiences and animal encounters. It’s a super-fun land and water tour combined. 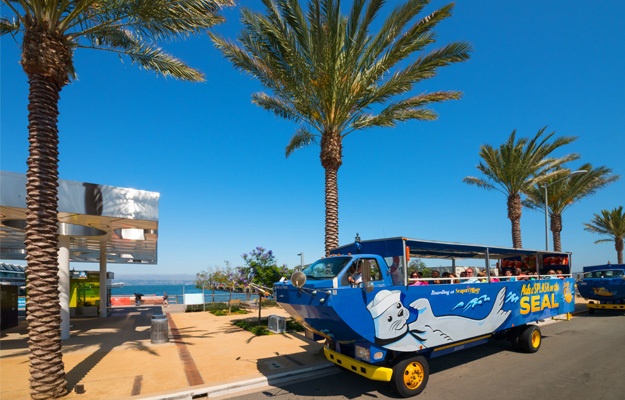 Climb aboard the big, bright blue, awkward-looking amphibious vehicle and off you rumble around San Diego’s active waterfront. Perched way up high, the view is terrific! The Captain and an engaging, entertaining on-board tour guide make sure you see all the highlights along the way. Lumber around to a boat ramp on Shelter Island where the Captain switches gears from land to sea mode and takes off for the splash-in! In propeller mode, the engine noise is muffled. It’s quiet as the SEAL bobs around a bit to reach a comfortable glide. Then, it’s off for a narrated boat tour around San Diego Bay. There’s activity everywhere. Fighter jets and helicopters take off from Naval Air Station North, cargo ships and an occasional destroyer pass by and, if you’re lucky, you’ll see an aircraft carrier in the distance. Near Point Loma rising high above the Bay entrance, submarines are moored. Everyone’s favorite: circling the floating bait cages to watch sea lions basking in the sun and frolicking around. Spring Break is Gray Whale migration time. From December until April, these magnificent creatures migrate down the California coast on their journey from the Bering Sea to the breeding grounds along the west coast of Baja California. Sighting these gigantic mammals breaking the water surface with a huge splash, seeing them spouting as they surface and fluking as they dive back down again is a once-in-a-lifetime experience. The 3.5 hour morning or afternoon trip, approximately 6 miles out into the Pacific, is comfortable on the ship with great viewing windows and decks. Families with teenagers will love speeding around San Diego Bay in small boats checking out the sights along the shoreline and getting up close to USS Midway, historic ships, sea lions frolicking on bait pens, dophins, sea birds, the Coronado Bridge and so much more! The cool thing: you drive your own 2- person small boat (18 and older and after a quick course in boat handling)! In the lead of the small boat flotilla is a knowledgeable, experienced guide who keeps his “fleet” on track and provides narration, which comes through 2-way communication in each boat throughout the 2 hour tour. Get out and explore by bike in glorious weather! Hike, Bike Kayak San Diego’s 2 hour downtown ride (for ages 13+) is a great way to see San Diego up close. Guides leading the tour mix it up with history, ecology and interesting facts. They make sure you see a lot, the well-known sights and unique spots you might miss on your own. Cruise along the waterfront, through the Gaslamp District and East Village surrounded by the city skyline and fabulous Bay views. The pace is not strenuous if you don’t mind a few short hills For families with kids 13 or younger, their Mission Bay Bike Tour is the perfect outdoor activity. San Diego Fly Rides has great professionally guided bike tours throughout the San Diego including La Jolla, Balboa Park, Coronado, Cabrillo National Monument, Mission Bay. San Diego Bike & Kayak Tours’ Downtown Bike Tour begins by cycling around Balboa Park, then heads to downtown, past views of the Coronado Bridge and Coronado, Point Loma. Sightseeing has never been more fun! Get out into the glorious outdoors and see San Diego by gliding through it on a Segway! Another Side of San Diego Tours‘ San Diego Segway Tour is an hour (plus ½ hour training) of gliding through the Gaslamp District, the happening place with a rich history, and along always active, always interesting Bayfront. A tour guide leads the pack, narrating along the way. If you love the ride, try their Coronado, Balboa Park, Embarcadero, Downtown and City & Bay Segway tours. For naturalists, good kayakers and anyone who loves the outdoors, this one’s for you! 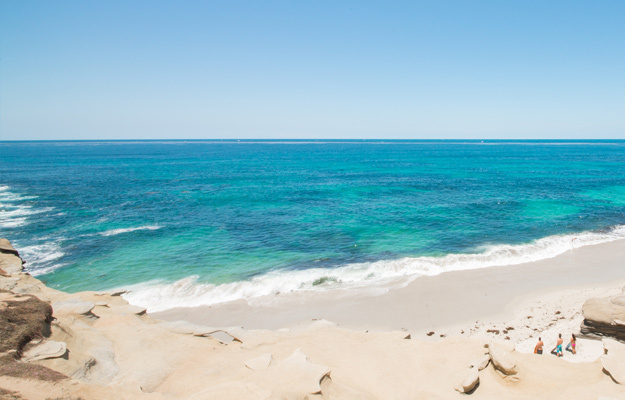 Head up to La Jolla for an amazing La Jolla Sea Cave and Ecological Reserve Kayak Tour with La Jolla Kayak. The scenery and possible sightings of wildlife, sea lions, dolphin, leopard sharks, seals, sea birds, is a fabulous experience, all explained by naturalist guides. For novice and beginner kayakers, here’s one for you: Kayak through the calm waters of Mission Bay on La Jolla Kayak’s family-friendly Mission Bay Kayak Tour. Biologist/naturalist guides serve as both educators and kayak coaches, ensuring everyone is comfortable and has fun! San Diego Bike & Kayak Tours‘ Coronado Kayak Tour explores San Diego Bay. 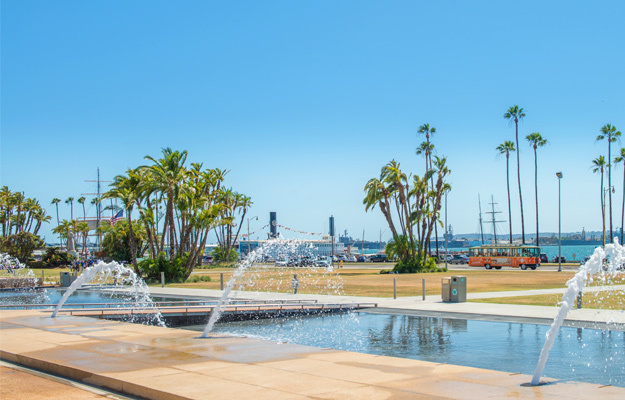 They also have a Bike & Kayak Tour that starts off with biking through Coronado and finishes with a kayaking trip around Coronado Bayfront, where views across the Bay and are magnificent.